Although the general purpose of Cooking Camp is to have fun, I do try to incorporate some specific skills into each week's lesson. 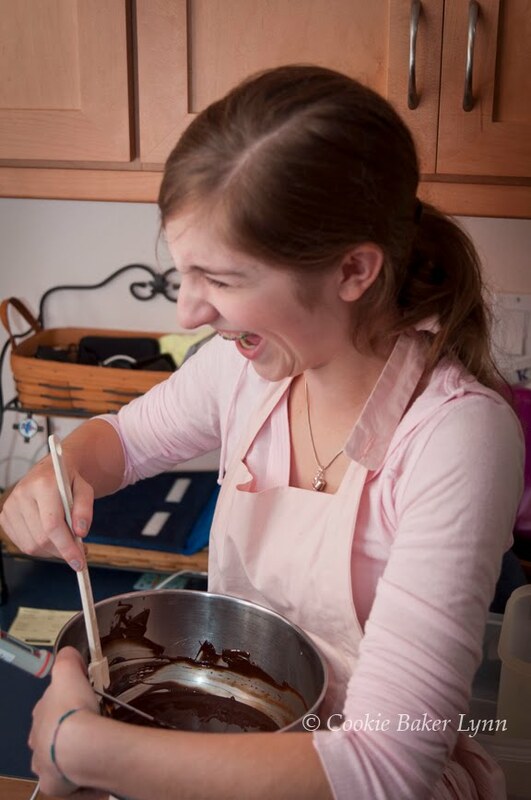 This week my band of happy little campers were to learn about working with chocolate. I'm not any kind of an expert, but since I have done tempering and dipping a few times without disastrous results, that's enough of a knowledge base to be able to pass along. The key to being a teacher is being at least one step farther along than the student, right? To showcase our tempering skills, I picked peppermint patties, those delightful confections with a cool peppermint center surrounded by the snap of dark chocolate. Mmmmmmm. The campers were excited to try them, but it was a bit difficult to get them to focus on the task at hand. I don't have many photos of them doing actual cooking tasks as they were constantly distracted by iPods, conversations, Words With Friends, and general goofiness. Trying to get three teenagers who are best friends to focus on a task is kind of like herding cats or juggling jello. I'm so glad I don't work in a high school! I tried a new recipe for the patties because this one didn't require the overnight air drying of my previous recipe. The peppermint filling was a bit stickier than I was anticipating, but once dipped, it was the creamiest, most delicious I'd ever had. 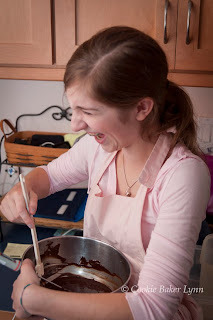 The tempering process ended up being a bust as far as a learning moment. Because it was a fairly warm day, the chocolate took a long time to cool and the campers cut short their kitchen time to go to the ice skating rink. Hey, I understand. Summer's short and you have to pack in as much as you can. So while they skated, I dipped, and they got to take home a bag of the most amazing peppermint patties you can imagine. Not the most beautiful (I've previously discussed my dipping skills), but what they lacked in glamour, they more than made up for in taste. 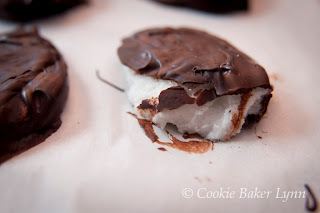 If you love peppermint patties, you've got to try these! They are wonderful on their own, but would also be amazing if you put them in brownies or ice cream; however, there are no guarantees you'd be able to keep them from just being eaten the day they're made. Beat 2 1/4 cups confectioners sugar with corn syrup, water, peppermint extract, butter, and a pinch of salt using an electric mixer (with paddle attachment if using a stand mixer) at medium speed until just combined. Knead on a work surface dusted with remaining 1/4 cup confectioners sugar until smooth. Roll out between sheets of parchment paper on a large baking sheet into a 7- to 8-inch round (about 1/4 inch thick). Freeze until firm, about 15 minutes. Remove top sheet of paper and sprinkle round with confectioners sugar. Replace top sheet, then flip round over and repeat sprinkling on other side. Melt three fourths of chocolate in a metal bowl set over a saucepan of barely simmering water. Don't let the temp get over 120 deg. F. Remove bowl from pan and add remaining chocolate, stirring until smooth. Cool until thermometer inserted at least 1/2 inch into chocolate registers 80°F. Balance 1 peppermint round on a fork and submerge in melted chocolate, letting excess drip off and scraping back of fork against rim of bowl if necessary, then return patty to sheet. Coat remaining rounds, rewarming chocolate to 88 to 91°F as necessary. Be sure to work in small batches. You need to keep the chocolate in the right temperature zone and the filling as close to frozen as possible. Once the filling warms up it goes all limp and is difficult to keep on your dipping fork. Let patties stand until chocolate is set, about 1 hour. In warm weather, store in the refrigerator. Note: In warm weather, the longest part of this process is waiting for the chocolate to cool down to 80 degrees. You can plan your work around this. Perhaps start with the melting of the chocolate, then making the peppermint filling as the chocolate cools. Oooohhhh, those look amazing! Cooking Camp is a great idea. I'm not a fan of chocolate and mint, but your description and your images for some reason reminded me of a cookie I loved when I was a kid: "Viva Puffs." With my vacation coming up, it is now my mission to both eat and possibly make my own :). Thank you, once more, for some inspiration :). P.S. And again, you're completely awesome for doing this with your daughter and her friends! (and only a little crazy :)). Momma Mindy - It's been fun! If you did a crafting camp, I would come. Adam - You should try these: http://cookiebakerlynn.blogspot.com/2007/09/mallowsmores.html. Thanks for the kind words. I think you're wrong, though. I'm pretty sure you're a lot crazy! I laughed out loud over herding cats or juggling jello.Peppermint patties are all time favourite I would have loved to be at camp Lynn! Ooo, my all time favorite candy treat! I'll have to try this one sometime because the last recipe I tried did not turn out as I hoped. These look perfect. I am so drooling here! 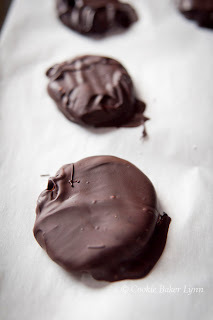 homemade peppermint patties is barely something i'm willing to attempt myself, much less with a horde of kids. kudos to you, lynn!